My pictures are concerned with the human figure and how it relates to its immediate surroundings. 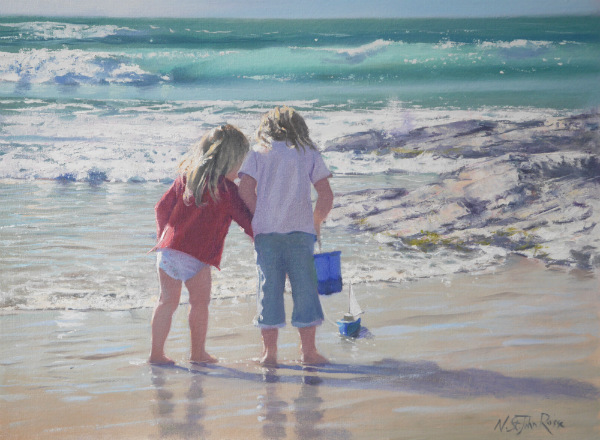 This could be in the studio, house, garden or street, but in most of my current paintings it applies to the seashore. All the visual and tactile properties of sand, rock, water and light envelop my subjects both pictorially and in reality. I try to convey their physical response and their moods. In general, I have found that when people feel they can relate to subject matter, they can then be coaxed more easily into an understanding of the deeper content of a picture. I am obsessed with my subject, which to me is an inexhaustible source of inspiration. Portrait painting has featured throughout my career. I have an abiding interest in the human face and the way it appears, or doesn’t, in figure compositions. I come from a traditional background of realism and sound draughtsmanship, but I also believe in the expressive use of oil paint. I have no qualms about marrying these three qualities in my paintings. For light relief I paint still life and other subjects.